LifePharm introduces LPGN DIGESTIVE+++. It is a combination of a stable mixture of Probiotic, which is a Prebiotic Blend combined with Enzyme Blends that promotes healthy intestines. LPGN Digestive+++ helps with indigestion and encourage better absorption of the nutrient. As one of the core health-promoting components in the human body, the digestive system is a combination of organs that converts food to nutrients needed for growth, energy and repair, and its importance cannot be overstated. We often search for solutions to help alleviate various ailments in the body, but many health challenges begin in the digestive system. Probiotics are organisms that result from harvesting good bacteria or yeast. For decades, a healthy dose of Probiotics has been proven to effectively improve digestion – naturally! These organism or good bacteria help our stomach to naturally produce the enzyme needed for proper digestion. Our digestive system is home to more than 500 different types of bacteria. They help keep the intestines healthy and assist in digesting food. Probiotics also help build a good immune system. These Probiotics among other things also help fight the bacteria that causes diarrhea – and stop it naturally. Research shows that digestive disorders occur in an unbalanced ratio of good and bad bacteria. This usually happens during an infection, weak and compromised body, or intestinal problems that may arise because of too many medicines or antibiotics that disturb our stomach’s lining. “Probiotics can improve intestinal function and maintain the integrity of the lining of the intestines,” says Stefano Guandalini, MD, professor of pediatrics and gastroenterology at the University of Chicago Medical Center. Digestive+++ is available starting November 24, 2014, Price for FAST ORDER is US$36 per box, 30 capsules. → How LifePharm’s Digestive may help aid acid reflux and GERD. What kinds of good bacteria and yeast are contained in the Digestive +++ ? Click here for ingredients. 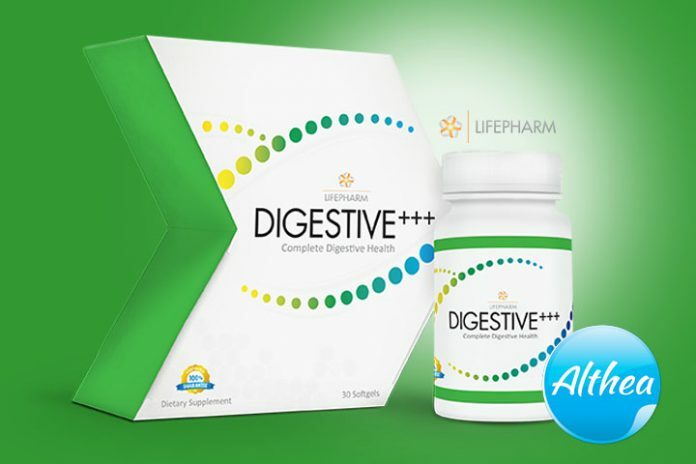 LifePharm Digestive are both prebiotic and probiotic supplement. Being diagnosed with vitamín B12 deficiency caused by the body not being able to absorb vitamin B12, can digestive +++ help with this? Digestive plus helps maintain gut integrity and healthy villi which in turn help the body absorb more efficiently any nutrients for that matter.